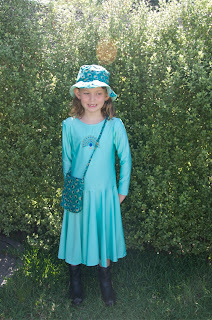 I was surprised when Emma asked me to make her a turquoise dress with a peacock - because her favourite colour is purple. When I asked her why she wanted this particular dress, she replied, "Because I think it would look good!" You have created a beautiful outfit for her. Hasn't she grown up?